Accessing SAS was never so easy. With SAS OnDemand for Academics software, SAS is just a click away! Yes, you hear it right. We can access SAS software for free by just logging to a SAS website. No installation is required and it's available for everyone - Instructors, Students and Individual Learners. In short, it's available for every other use than commercial. It's an important step taken by SAS marketing team to counter competitors such as R and Python. There was a time when accessing SAS software and learning SAS programming is such as pain. With this software and SAS University Edition (UE) for free, learning SAS programming is no more a distressing task. 2. Submit the required details (first name, last name and Email ID) in the registration page. 3. 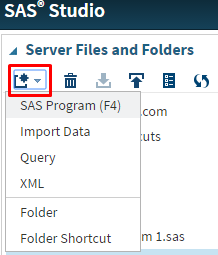 You will get an email from SAS team with the link to activate your profile. 4. You need to enter your email address and password information and accept the license agreement and then click Create Account. 5. After completing step 4, you will get an email with the subject 'You are ready to start using SAS OnDemand for Academics' and user id. Click on the link specified in the email. 6. Enter your user id and password to log in to the software. Free 5GB of personal data storage. Additional 2 GB data storage for Instructors. If you do not use your account for a period of one year, then your account might expire. You can access not only Base SAS, SAS STAT modules but also access SAS GRAPH, SAS modules for econometrics (ETS) and operation research (OR). And if you are searching for free SAS 9.4 or free SAS Enterprise Miner, your search is over. You will get the latest version of SAS and popular SAS packages for free. If you are a statistician or data scientist, you can practise data mining and text mining techniques with SAS Enterprise Miner and Text Miner for absolutely free. First select the Files (Home) area and then the fourth icon under 'Server Files and Folders' would be visible and then click on Choose Files box and hit Upload button. In the code above, the first highlighted blue portion of the code (youruserid) refers to your user id and the second highlighted portion refers to name of your uploaded file. 10 Responses to "Free SAS Access - No Install Required"
While try to logging with username and password, I got the message as "Public access has been denied. Public users are not allowed to access this SAS application. The current user has been signed out." Is there any difference in the view and functioning of academic sas version and sas university version? How can I access SAS Enterprise Guide and SAS Enterprise Miner? 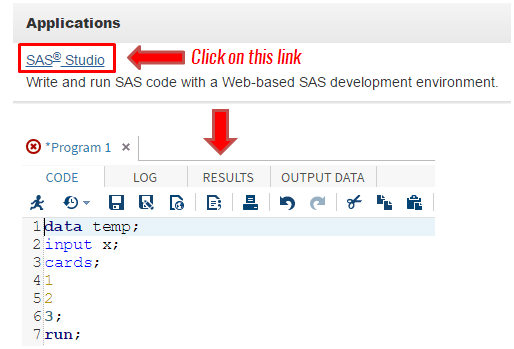 I can see only SAS Studio when I login using on demand for academics. How long it will take to receive 'You are ready to start using SAS OnDemand for Academics' and user id email? I already wait for hours. My Name is Sakshi Jain. I am unable to log in into SAS on Demand for academics. It says that there is some technical Error.